Saturday stared off waking up at the unholy hour of 7 o’clock. Why? parkrun of course! Due to Storm Brian (I still laugh at that name) a course inspection was required. I offered to lend a hand and a light trot along one section of the course revealed no problems. Parkrun in Penallta was on! 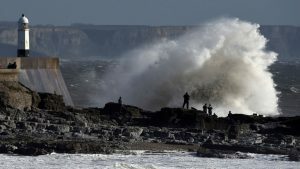 Storm Brian brought terrible weather with torrential rain and gale strength winds across Wales and some parkruns were cancelled as a result. I was soaking and freezing to my core even before the event started! But 9am came around Brian calmed down – almost like he knew it was parkrun time. I make Brian out to be a drunk fifty year old man, he’s not of course he’s a storm! So to all the Brian’s out there – who I’m sure are all lovely – I’m sorry that the Met Office names these storms! So this Saturday, in my infinite wisdom, I chose one of the worst days of the year to run my first parkrun in over a month. Having said that, I still enjoyed it as no storm Brian can dampen the spirit at parkrun, and am quite content with my time of 29:44 as well! Plus, I was first in my age category (even if I was the only one it still counts right?)! But to finish it all off, Brian did make a final appearance in the closing minutes of parkrun to make sure that he wasn’t finished with us yet. Packing up was a challenge to say the least! Finally, I would like to unreservedly apologise to Brian for any foul language directed towards him, by myself, parkrunners or otherwise as he did pose us a challenging run! I’d like to dedicate this blog to the memory of the 144 killed in the Aberfan disaster, which happened on October 21st 1966.